Met Agwe Tawoyo, the Great Admiral, the Sovereign King of the Sea shares his realm with the beautiful La Sirene Diament; who some say is his wife, while others say his daughter. Together, they form the Divine royalty of the sea. They are the Divine Royal Couple manifested within the sea and they carry all of the mysteries contained within the sea within themselves. Service to Met Agwe and La Sirene is service to all of the greatest mysteries and all that they contain. Met Agwe himself is more than just a King of the Watery realm. He is seen as an admiral, although it is unlikely that he ever was manifest on earth in that role. Met Agwe comes from the very origins of our world, when the world was covered in nothing but water. As such, he is amongst the first of all the lwa, together with Odan, Danballa Wedo, La Sirene and the various Spirits that came forth directly from the water. Met Agwe has taken on an image that we understand, the Admiral that rules over all of the waters. As we have adapted our relationship with the sea, so too has Met Agwe. Where once he traveled through the sea in his pearl shell chariot drawn by dolphins and sea horses, he now travels aboard his boat IMAMOU; surrounded by his sailors and his warriors, an entire ship of Spirits who obey his every command. His word aboard his ship is law, just as his word is law throughout the sea. As a result, Met Agwe is close to all those who make their livelihood from the sea. He rules over the Navy, and all navy men and woman. He also is closely associated with fishermen, and all sailors … Yacht races fall under his control and domain, so while we are watching the America’s Cup regatta, we are watching another manifestation of Agwe’s realm. For this reason, Met Agwe is always given a boat within the peristyle. It most often will hang from the roof of the peristyle where it can move with the wind replicating the movement of a boat upon the sea. His altar also reflects his nautical nature with symbols from the sea and ships, such as ship wheels, mirrors, large shells, even anchors etc., He is also served with symbols of wealth, such as gold coins and chests of treasures, and Met Agwe is often called upon to help with material wealth, because the greatest wealth is contained within the sea. So many treasures have been left within the depths of Met Agwe’s realm and it’s not uncommon for him to bestow many gifts of wealth and prosperity amongst those whom he loves and who serve him well. When Met Agwe comes in possession he is set on a ti chase (a little chair) and given a staff which he uses like a rudder as he moves around the peristyle greeting everyone in attendance and giving any advice or orders with military precision. His advice is always heeded because he comes with the wisdom that comes with the clarity of foresight. He is surrounded by the water, the greatest tool for seeing the future, and so his advice comes from that vision. Met Agwe as the Master of the Sea is also the Mater of the Land which is governed by the sea. We are taught, ‘Lwa se mister’, meaning the Lwa are Mysterious, and Met Agwe’s powerful nature is just as mysterious. He is the Master of Earthquakes and is sometimes called “Earth Shaker” amongst his praise names. Hounfo Racine Deesse Dereyale is especially dedicated to Met Agwe, as we are surrounded by water here in New Zealand. We make regular trips to local beaches, and prepare small “bak Agwe” as offerings to him. 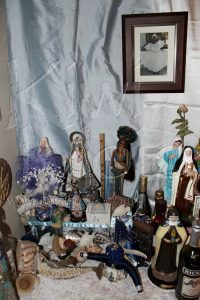 These small bak are prepared as baskets that are dressed and decorated in white, blue and silver fabrics and ribbons, and filled with offerings for Him and La Sirene. 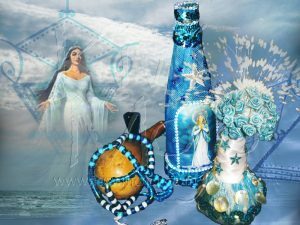 Offerings of flowers, white wine and champagne, money, cakes iced in blue, green, silver and white, mirrors, Florida Water, a Comb, and watery fruits such as melons, mango, cantaloupe, grapes and green apples. 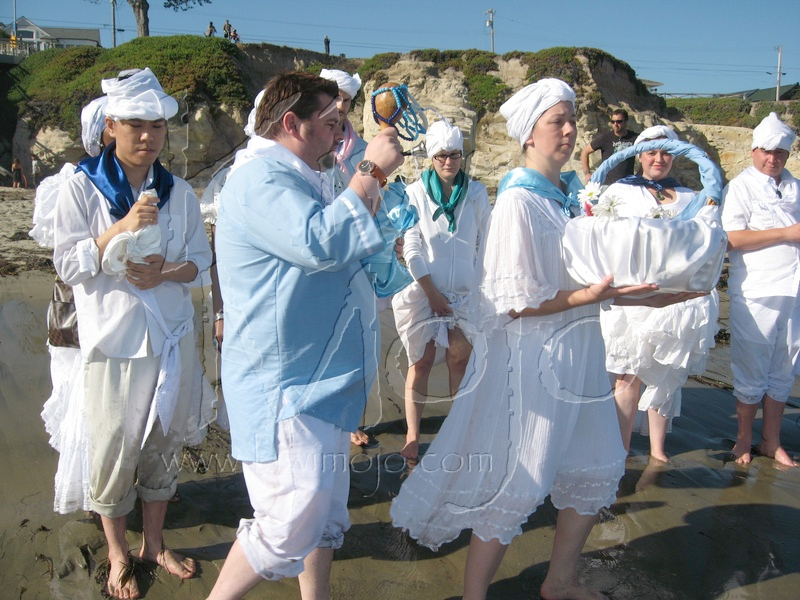 The bak also is given blue and white candles and is taken out into the sea. It is given to Agwe with songs and prayers, and of course with love and our sincerity. When the bak is taken by Agwe it will sink immediately out of site, a sign that the Lwa have taken the offering. Met Agwe is seen as a tall, white bearded man, an extremely handsome mulatto with green eyes. He is a suave gentlemen, reserved, yet who commands respect. He is understanding, he is patient, he is kind, but he is a parent, and he can also be stern and it is unwise to be on his bad side. Just as the Ocean can be calm and gentle, so can Met Agwe … but the sea can also be tumultuous, and so can Met Agwe. Agwe comes to us from the Allada Kingdom of Dahomey, he journeyed from Africa to St. Dominique with the transatlantic slave trade, and so he has an important place in every peristyle in Haiti. Many of our ancestors were given to his kingdom during the transatlantic trips as so many slaves did not survive the middle passage. He is also the one that carries all of us, after death, during our time anba dlo, or under the water. We will all enter is realm in one way or another and we welcome him with honour, with love and with respect. Agwe oh oh signim lode oh oh! Joum angage ma rele Agwe oh oh! Og gain yo kou deye papa map pare tan yo! Sirene Oh, se mwen Balen oh! Sirene Oh, se mwen Balen kap kommande. La Sirene, the beauty of the waves, Queen of the sea, Queen of the Song. Sirens [or mermaids] have captivated the human experience of the sea throughout history. Sailors and pirates, fishermen and even ocean protestors have reported seeing the most beautiful woman, sitting atop a rock, a mirror in one hand, a comb in the other, brushing her long beautiful hair. Her song calls out, intoxicating the very air around her, drawing the attention of men. This is La Sirene, the beautiful one, the intoxicating temptress whose kingdom is at the very depths of the sea, but who is known to walk amongst the waves. La Sirene is the patroness of Music … her voice is renowned as it carries over the seas calling to the men that she will take as her lovers. However, just as it is sensual, it is full of knowledge. As with Met Agwe, La Sirene is a keeper of the secret knowledge of the sea, and she weaves this knowledge into the songs that she sings for her children, and all of those that have passed through the djevo. 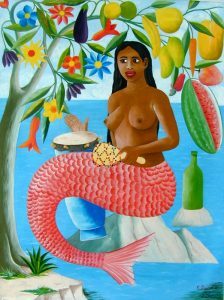 Although it is Mambo Ayizan that is the Mother of all initiates, it is Mambo La Sirene that sings to them beneath the sea as they die and are prepared to be reborn. It is at this time with she sings gently of the mysteries beneath the sea so that that emerging Houngan and Mambo may have all the tools necessary to work with these secrets, which are entrusted to the Lwa by the Glory of Bondye – the Good God. La Sirene is not just beautiful beyond words, but she is considered one of the most powerful of all lwa. Many Houngan and Mambo will not swim with their head under the water in the sea for fear that La Sirene may indeed come and take them to her underwater kingdom, where she will keep them for a time, teaching them all the ways of magic. This is not mere superstition in Haiti, as many who have been swimming in the sea will simply disappear, not to be seen for 7 years. At this end of this time, miraculously, from no where, they will return. They will be paler than they were before, their hair oftentimes white, or streaked with grey, an outward sign of the time spent under the water, but also these people will be skilled in the use of magic and treatment, they will have divination skills that will exceed even the most notable of diviners among the Houngan and Mambo, these are the skills that they have exchanged 7 years of their live for, and those who have made the exchange never seem to regret it. La Sirene, like all beautiful ladies, does not walk (or in this case, swim) alone. She is accompanied by some amazing lwa. Always with her is Met Agwe Tawoyo, and the strong Domanyan Agwe. Among her mistresses walks La Blanc, the beautiful white goddess of the sea, Zile, Dereyale, Ceverine and La Don. La Don reminds us of the interconnectedness of the Sea and the Moon, that neither one is balanced without the other. Sometimes at the time of the full moon, when the tides are going out, we travel to the sea so that we can make offerings to La Sirene while she is bathed in the greatest of lights that is a reflection of the water itself. La Sirene, being a water Spirit is as old as the waters of the Earth. When she comes in possession she does not speak, she should be kept wet or she will cry to be far from the water, and will not speak. Rather she will make the sounds of an instrument, these can be beautiful, and she will not walk, although sometimes she will be assisted around the peristyle by hounsis who will lift her from the ground. At other times she will drag herself around. She has a tail rather than legs so she can not stand. All colours of the sea belong to La Sirene, the blues an the green whites and silvers that one can find in the ocean. She is often served with the image of Diosa de la Mer or Our Lady of Charity of Copper. Her feast is in December. Offerings are always made to Met Agwe and La Sirene together, so the basket prepared above is perfect for a first date with the Watery Royal Couple, it opens the door for us to get know her better. She loves Champagne, she loves sweet cakes, but as with Agwe we do not give her anything that comes from the sea, no fish, no seaweed, no no lobster or crab or shellfish. We can not give her what is already hers, and so we stick to sweet cakes, puddings, watery fruits and delicious meats that come from the land. We often will give her duck, goose, or even lamb. At a fet for Met Agwe and La Sirene, a wooden bak will be prepared and decorated, then filled with offerings. This is a much larger offering than a small basket, and is taken further out to sea. After making the La Priye Ginen and all the preparations, members of the House will climb into a boat with the beautifully prepared bak Agwe and go out to sea where they will offer the bak to the waters. If it sinks, Met Agwe and La Sirene have accepted the offering.